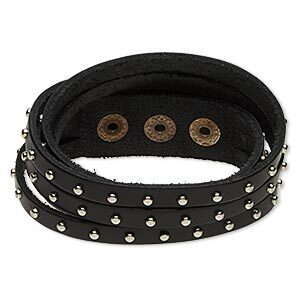 Bracelet, leather (dyed) and imitation rhodium-plated steel, black, 36mm wide with spikes, adjustable at 6 and 7 inches with double snap closure. Sold individually. Item Number: H20-6799JD Have a question about this item? 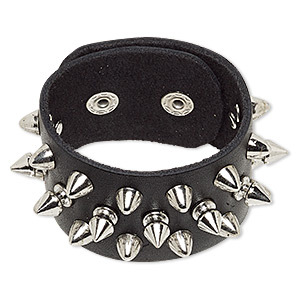 Ready-to-wear leather bracelet with spikes is ideal for gift-giving, counter sales or extending current jewelry lines. Closure with two snaps provides an adjustable fit. Colors, shapes and sizes may vary in each lot. Bracelet, leather (dyed) / gold-finished / imitation rhodium-plated brass / steel, brown and black, 36mm wide with woven design, adjustable at 6-1/2 and 7 inches with double snap closure. Sold individually. 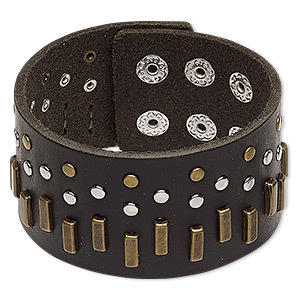 Bracelet, leather (dyed) / imitation rhodium- / antique brass-plated steel / "pewter" (zinc-based alloy), black, 38mm wide with rectangle and round studs, adjustable from 5-1/2 to 6-1/2 inches with double snap closure. Sold individually. 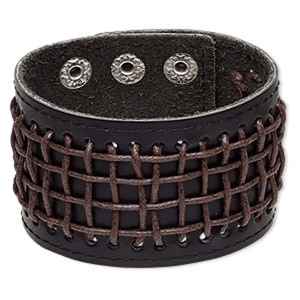 Bracelet, leather (dyed) with imitation rhodium-plated steel and "pewter" (zinc-based alloy), black, 27mm wide with braided design, adjustable from 5-1/2 to 7 inches with snap closure. Sold individually. 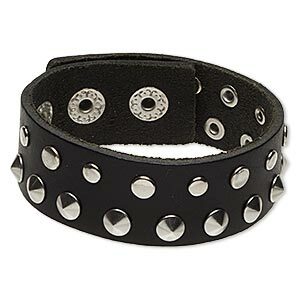 Bracelet, leather (dyed) with imitation rhodium-plated steel and "pewter" (zinc-based alloy), black, 22mm wide with round studs, adjustable from 5-1/2 to 6-1/2 inches with snap closure. Sold individually. 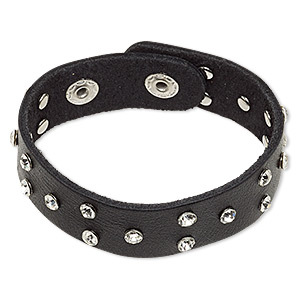 Bracelet, leather (dyed) / glass rhinestone / imitation rhodium-finished steel, black and clear, 22mm wide with rivets, adjustable at 6 and 7 inches with double snap closure. Sold individually. 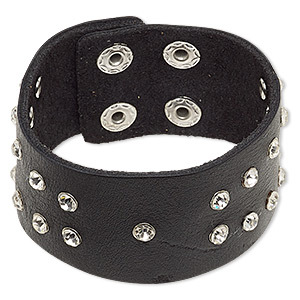 Bracelet, leather (dyed) / glass rhinestone / imitation rhodium-finished steel, black and clear, 33mm wide with rivets, adjustable at 7-1/2 and 8 inches with double snap closure. Sold individually. 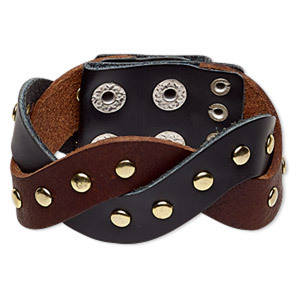 Bracelet, leather (dyed) / waxed cotton cord / imitation rhodium-plated steel, black and brown, 46mm wide, adjustable from 6 to 7-1/2 inches with double snap closure. Sold individually. 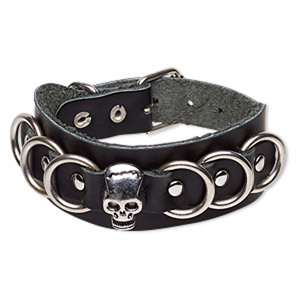 Bracelet, leather (dyed) with imitation rhodium-plated steel and "pewter" (zinc-based alloy), black, 30mm wide with skull and ring design, adjustable from 5-1/2 to 7 inches with buckle-style closure. Sold individually. 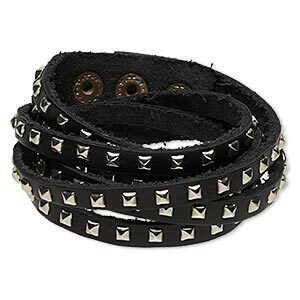 Bracelet, wrap, leather (dyed) with imitation rhodium-plated steel and "pewter" (zinc-based alloy), black, 20mm wide with square studs, adjustable at 6 and 6-1/2 inches with snap closure. Sold individually. 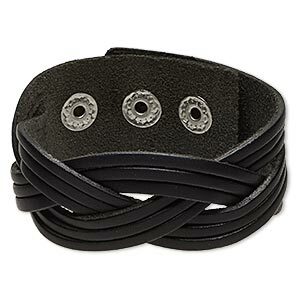 Bracelet, wrap, leather (dyed) with imitation rhodium-plated steel and "pewter" (zinc-based alloy), black, 20mm wide with round studs, adjustable at 6-1/2 and 7 inches with snap closure. Sold individually.